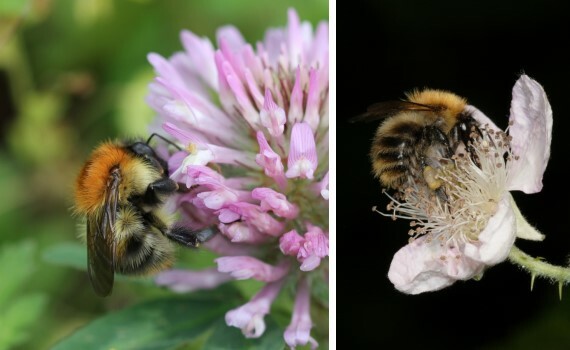 The only one of three all-ginger bumblebees to be a member of the ‘Big 7’ widespread and abundant species, it is found in a wide range of habitats across the UK, including gardens. The earliest of the carders to emerge in spring, and usually the latest-flying of the bumblebees from summer nests (Buff-tailed bumblebees, Bombus terrestris, increasingly show winter-nesting behaviour). Males, workers and queens are similar in appearance, ginger-brown all over with no clearly-delineated tail. Females usually have creamy-white sides to the thorax while males are often yellower, with more obvious facial hair tufts. Common carder bumblebees. Photo credits: Linda Peall (left), Ben Darvill (right). 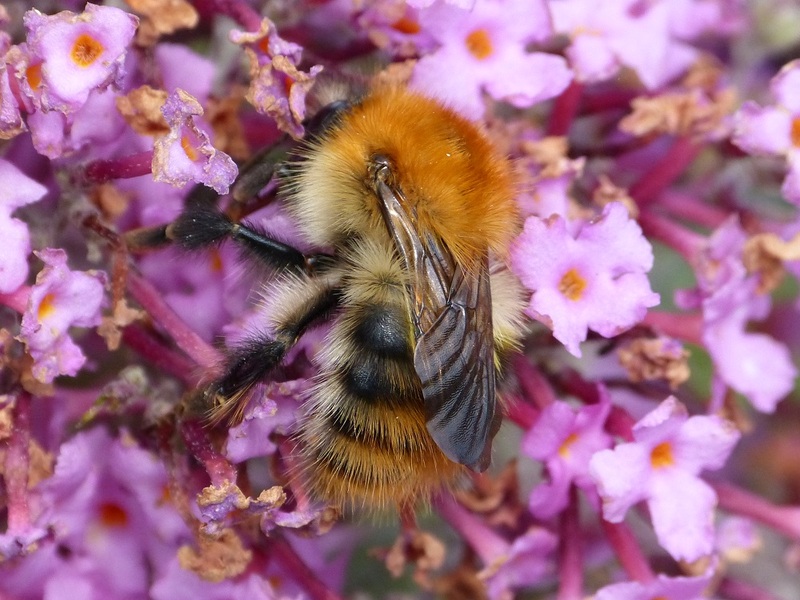 Only three species (Common carder bee; Moss carder bee, Bombus muscorum; and Brown-banded carder bee, Bombus humilis) are all-ginger, and consequently the trio can be easily split off from other bumblebees. A few others (notably the Great yellow bumblebee (Bombus distinguendus) and the Field cuckoo bumblebee (Bombus campestris) can look unicolorous, but these are yellow, rather than ginger, and always have a dark bar between the wing bases. Separating the three ginger carders can be considerably harder. Across much of the UK, the only species present is the Common carder bee, but in good habitat across northern Scotland and the southern coast the Moss carder bee is widespread (if often uncommon), while the Brown-banded carder bee is thinly spread across the south. The Common carder bee has black hairs on the abdomen, unlike the two rarer species, and males can also be distinguished by their genital capsules and by the bulging antennal segments. The Channel Islands population are of the continental subspecies flavidus and show very few black abdominal hairs, sometimes only visible through a microscope when the abdomen is fully distended: at the other extreme, some mainland individuals have so many black hairs that they can appear to show a black band across the abdomen, but the ginger tail colour will still split the species from the Tree bumblebee (Bombus hypnorum).